Home / Unlabelled / 10 Companions Were Promised Paradise – Who Are They? 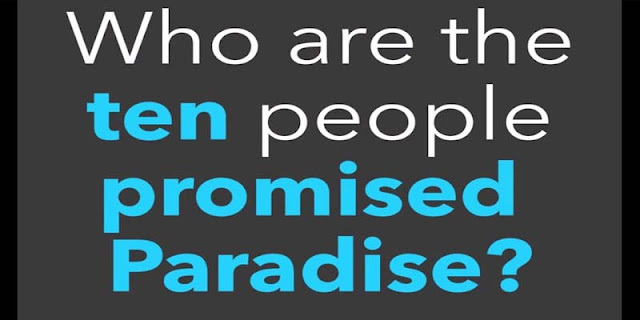 10 Companions Were Promised Paradise – Who Are They? The greatest and most profound achievement of this world is to make Jannah (paradise). From the commencement of life on earth till this day and generations to come, the only hope that we as Muslims are optimistic about is the belief that someday all our ups and downs shall come to an end and we will be rewarded bountifully in paradise. With the grace of Allah some among the Muslim ummah have known of their fate that their final abode is Jannah. With that in mind, below are some of the 10 luckiest people to walk the surface of the earth. Abu Bakr was given the title of “As Siddiq” or” (Testifier to the Truth). He was two and a half years younger than prophet Muhammad and the first among men to enter Islam. He was always a very close companion of the Prophet Muhammad. And he knew him better than any other man. He reigns from Quraish, the tribe of Banu Adi. And lived as one of the most powerful and most influential Muslim caliphs known in history and succeeded Abu Bakr as the second caliph. This is the man whose name is paired with justice and truth, strength and courage, and asceticism and godliness. He was pious, observing and fearing Allah, and crying out of fearing Him. He is the second Caliph and one of the in-laws of the Prophet. His conversion to Islam marked the beginning of a new phase of the call. Uthman ibn Affan was born in Taif, near Mecca approximately six years after the Year of the Elephant to a wealthy family of Quraish. Throughout his life he was kind, generous man and even before his conversion to Islam he would freely give money to help those in need. His marriage to two daughters of the Prophet had earned Uthman the nickname Dhun-Noorayn (the one with the two lights). Ali was born on the 13th Rajab the month of the Elephant. The love between Ali and the prophet was divine because they had a lot in common; not looks nor attitude but they were both born in the month of the Elephant and both shared a common grand father, Abdul Mutalib. The Messenger of Allah once wore two coats of armor and tried to get up on a boulder, but was unable to, so Talha squatted under him, lifting the Prophet such that he could sit on the boulder. Allah was so pleased with Talha’s help and the Prophet informed Talha that Paradise was now obligatory on him. (Tirmidhi) He came to be known as “Talha the Generous” and “Talha the Good” for his generosity. He was well known for helping those in debt, households experiencing difficult times, and widows. He is well known in the books of seerah as “The Disciple” of the Prophet. The Prophet himself gave him this title. He was also a prominent companion of the prophet and loved him very much. His love was not merely due to the relationship between Allah’s Messenger and him. Abdur-Rahman was one of the first eight persons to accept Islam. He was one of the ten persons assured of entering Paradise. And one of the six persons Umar chose to form the council of shura to choose the Caliph after his death. He accepted Islam only two days after Abu Bakr as-Siddiq did. Sa’d was born in mecca. He was seventeen years old when he embraced Islam. Sa’d was the seventeenth person to embrace Islam. He is mainly known for his commandership in the conquest of Persia in 636, governorship over it, and diplomatic visit to China in 616 and 651. Sa’id ibn Zaid was born in Makkah in the year 22BH (Before Hijrah). He inherited his father’s religious beliefs of Islamic Monotheism, and accepted Islam at an early age. Sa’id with his wife accepted Islam when only a handful were Muslims. They went through all sorts of abuse, ridicule and torture because of their decision. Sa’id and his wife Fatimah binti Khattab were instrumental in the conversion of Umar bin Khattab who became one of the greatest followers of Islam. He served in the Islamic army of conquest for a long time and played an important role in making the region of Iraq and Syria become part of the Islamic land. By character and nature, he was very humble and modest. Amongst his friends, he was gentle and soft as silk. When it came to war, he was as hard as iron. During the battle of Uhud, he lost his two front teeth. It was within this battle that two of the iron links of the Prophet’s helmet pierced his blessed head. Ubaidah bin Al-Jarrah pulled them out with his teeth. His integrity and honesty was unparalleled even amongst the companions of the Prophet.